Last week, we looked at a couple of the fan theories that we agreed with, at least in part, regarding the identity of the Red Angel … and this week, we found out if we were right. But we'll come to that later on. Given that this week's episode is titled "The Red Angel," there was a pretty good chance we'd learn something significant about this mysterious entity. In an episode that's heavy with emotional performances, you'll find yourself reaching for the tissue box basically from the very beginning. We begin with the funeral of Lt. Cmdr. Airiam (Hannah Cheesman) taking place in the shuttle bay with the whole crew gathered. It's well-handled and many of the senior officers share kind, thoughtful words. However, we suspect they didn't go to all this trouble after Lt. Connolly (Sean Connolly Affleck) unceremoniously slammed into an asteroid in the season premiere. Perhaps he just wasn't very popular. A big focus of this episode is the attempt to reconcile the relationship between Cmdr. 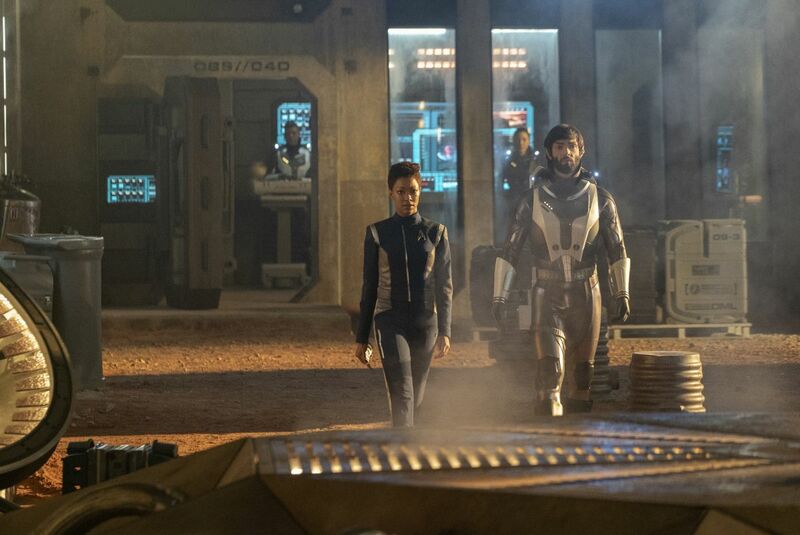 Burnham (Sonequa Martin-Green) and Lt. Ash Tyler (Shazad Latif), and it begins immediately after the funeral. A large focus of this subplot is that Tyler did not send the unauthorized, encrypted subspace transmissions he was accused of sending; that was Airiam, acting under the influence of malicious code sent to the Discovery computer by the modified probe/squiddie in "Light and Shadows" (S02, E07). There's some nice dialogue between Burnham and Tyler throughout the episode, as she feels guilty for having blamed him. But she still struggles to let him back into her life, because she feels he's abandoned his morals to work for Section 31.